Siberia (/saɪˈbɪəriə/; Russian: Сиби́рь, tr. Sibír';, IPA: [sʲɪˈbʲirʲ] ( listen)) is an extensive geographical region spanning much of Eurasia and North Asia. Siberia has historically been a part of modern Russia since the 17th century. The region has paleontological significance, as it contains bodies of prehistoric animals from the Pleistocene Epoch, preserved in ice or in permafrost. 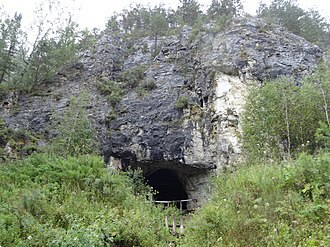 Specimens of Goldfuss cave lion cubs, Yuka (mammoth) and another woolly mammoth from Oymyakon, a woolly rhinoceros from the Kolyma River, and bison and horses from Yukagir have been found. The Siberian Traps were formed by one of the largest-known volcanic events of the last 500 million years of Earth's geological history. Their activity continued for a million years and some scientists consider it a possible cause of the "Great Dying" about 250 million years ago, – estimated to have killed 90% of species existing at the time. 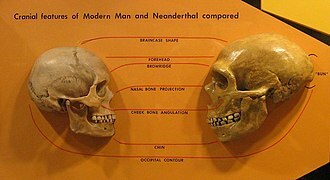 At least three species of human lived in Southern Siberia around 40,000 years ago: H. sapiens, H. neanderthalensis, and the Denisovans. In 2010 DNA evidence identified the last as a separate species. 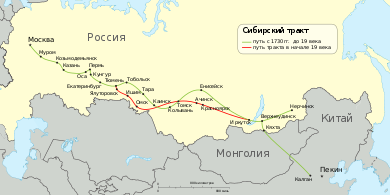 The map of the Siberian Route in the 18th century (green) and the early 19th century (red). With the breakup of the Golden Horde, the autonomous Khanate of Sibir was established in the late 15th century. Turkic-speaking Yakut migrated north from the Lake Baikal region under pressure from the Mongol tribes during the 13th to 15th century. Siberia remained a sparsely populated area. Historian John F. Richards wrote: "... it is doubtful that the total early modern Siberian population exceeded 300,000 persons." The growing power of Russia in the West began to undermine the Siberian Khanate in the 16th century. 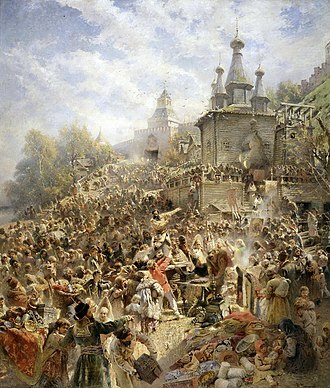 First, groups of traders and Cossacks began to enter the area. 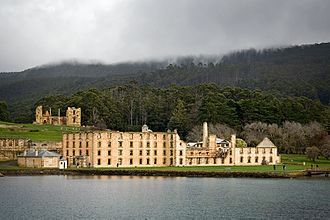 The Russian Army was directed to establish forts farther and farther east to protect new settlers from European Russia. Towns such as Mangazeya, Tara, Yeniseysk and Tobolsk were developed, the last being declared the capital of Siberia. At this time, Sibir was the name of a fortress at Qashlik, near Tobolsk. Gerardus Mercator, in a map published in 1595, marks Sibier both as the name of a settlement and of the surrounding territory along a left tributary of the Ob. Other sources[which?] 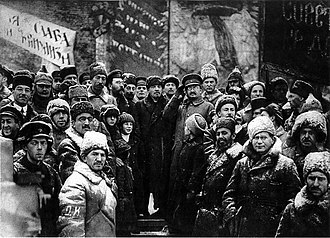 contend that the Xibe, an indigenous Tungusic people, offered fierce resistance to Russian expansion beyond the Urals. Some suggest that the term "Siberia" is a Russification of their ethnonym. 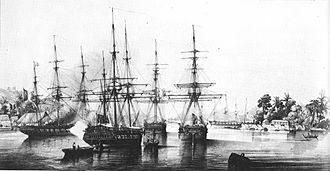 By the mid-17th century, Russia had established areas of control that extended to the Pacific. Some 230,000 Russians had settled in Siberia by 1709. Siberia was a destination for sending exiles. At 7:15 a.m. on 30 June 1908, millions of trees were felled near the Podkamennaya Tunguska (Stony Tunguska) River in central Siberia in the Tunguska Event. Most scientists believe this resulted from the air burst of a meteor or a comet. Even though no crater has ever been found, the landscape in the (sparsely inhabited) area still bears the scars of this event. In the early decades of the Soviet Union (especially the 1930s and 1940s), the government established the Gulag state agency to administer a system of penal labour camps, replacing the previous katorga system. According to semi-official Soviet estimates, which were not made public until after the fall of the Soviet government, from 1929 to 1953 more than 14 million people passed through these camps and prisons, many of which were in Siberia. Another seven to eight million people were internally deported to remote areas of the Soviet Union (including entire nationalities or ethnicities in several cases). Half a million (516,841) prisoners died in camps from 1941 to 1943 due to food shortages caused by World War II. At other periods, mortality was comparatively lower. The size, scope, and scale of the Gulag slave labour camps remains a subject of much research and debate. Many Gulag camps were positioned in extremely remote areas of northeastern Siberia. The best known clusters are Sevvostlag (The North-East Camps) along the Kolyma River and Norillag near Norilsk, where 69,000 prisoners were kept in 1952. Major industrial cities of Northern Siberia, such as Norilsk and Magadan, developed from camps built by prisoners and run by former prisoners. With an area of 13.1 million square kilometres (5,100,000 sq mi), Siberia makes up roughly 77% of Russia's total territory and almost 10% of Earth's land surface (148,940,000 km2, 57,510,000 sq mi). While Siberia falls entirely within Asia, many authorities such as the UN geoscheme will not subdivide countries and will place all of Russia as part of Europe and/or Eastern Europe. Major geographical zones include the West Siberian Plain and the Central Siberian Plateau. Eastern and central Sakha comprises numerous north-south mountain ranges of various ages. These mountains extend up to almost 3,000 metres (9,800 ft), but above a few hundred metres they are almost completely devoid of vegetation. 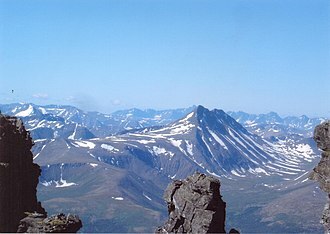 The Verkhoyansk Range was extensively glaciated in the Pleistocene, but the climate was too dry for glaciation to extend to low elevations. At these low elevations are numerous valleys, many of them deep and covered with larch forest, except in the extreme north where the tundra dominates. Soils are mainly turbels (a type of gelisol). The active layer tends to be less than one metre deep, except near rivers. 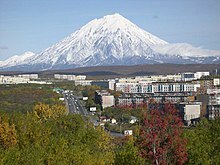 The highest point in Siberia is the active volcano Klyuchevskaya Sopka, on the Kamchatka Peninsula. Its peak is at 4,750 metres (15,580 ft). The Central Siberian Plateau is an ancient craton (sometimes named Angaraland) that formed an independent continent before the Permian (see the Siberian continent). It is exceptionally rich in minerals, containing large deposits of gold, diamonds, and ores of manganese, lead, zinc, nickel, cobalt and molybdenum. Much of the area includes the Siberian Traps—a large igneous province. This massive eruptive period was approximately coincident with the Permian–Triassic extinction event. The volcanic event is said to be the largest known volcanic eruption in Earth's history. Only the extreme northwest was glaciated during the Quaternary, but almost all is under exceptionally deep permafrost, and the only tree that can thrive, despite the warm summers, is the deciduous Siberian Larch (Larix sibirica) with its very shallow roots. Outside the extreme northwest, the taiga is dominant, covering a significant fraction of the entirety of Siberia. Soils here are mainly turbels, giving way to spodosols where the active layer becomes thicker and the ice content lower. 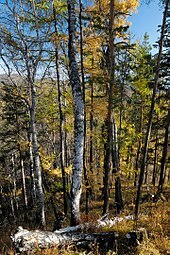 Vegetation in Siberia is mostly taiga, with a tundra belt on the northern fringe, and a temperate forest zone in the south. The climate of Siberia varies dramatically, but it typically has short summers and long, brutally cold winters. On the north coast, north of the Arctic Circle, there is a very short (about one-month-long) summer. Almost all the population lives in the south, along the Trans-Siberian Railway. The climate in this southernmost part is Humid continental climate (Köppen Dfb) with cold winters but fairly warm summers lasting at least four months. The annual average is about 0.5 °C (32.9 °F). January averages about −20 °C (−4 °F) and July about +19 °C (66 °F) while daytime temperatures in summer typically are above 20 °C (68 °F). With a reliable growing season, an abundance of sunshine and exceedingly fertile chernozem soils, southern Siberia is good enough for profitable agriculture, as was proven in the early 20th century. By far the most commonly occurring climate in Siberia is continental subarctic (Koppen Dfc or Dwc), with the annual average temperature about −5 °C (23 °F) and an average for January of −25 °C (−13 °F) and an average for July of +17 °C (63 °F), although this varies considerably, with a July average about 10 °C (50 °F) in the taiga–tundra ecotone. The Business oriented website and blog Business Insider lists Verkhoyansk and Oymyakon, in Siberia's Sakha Republic, as being in competition for the title of the Northern Hemisphere's Pole of Cold. Oymyakon is a village which recorded a temperature of −67.7 °C (−89.9 °F) on 6 February 1933. Verkhoyansk, a town further north and further inland, recorded a temperature of −69.8 °C (−93.6 °F) for three consecutive nights: 5, 6 and 7 February 1933. Each town is alternately considered the Northern Hemisphere's Pole of Cold, meaning the coldest inhabited point in the Northern hemisphere. Each town also frequently reaches 86 °F (30 °C) in the summer, giving them, and much of the rest of Russian Siberia, the world's greatest temperature variation between summer's highs and winter's lows, often being well over 170–180+ °F (94–100+ °C) between the seasons. [not in citation given] The rural locality of Delyankir, also in the Sakha Republic, is another candidate for the "Northern Pole of Cold", as its average temperature throughout all winter months is lower than that of either Oymyakon or Verkhoyansk, and it also has a lower yearly average temperature. Its record low of −65 °C (−85 °F) is slightly higher than the record lows set at Oymyakon and Verkhoyansk, however. Southwesterly winds bring warm air from Central Asia and the Middle East. 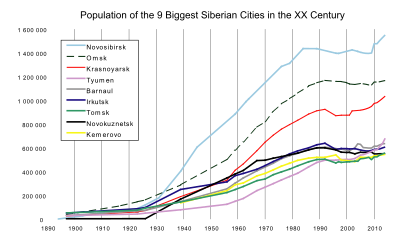 The climate in West Siberia (Omsk, Novosibirsk) is several degrees warmer than in the East (Irkutsk, Chita) where in the north an extreme winter subarctic climate (Köppen Dfd or Dwd) prevails. But summer temperatures in other regions can reach +38 °C (100 °F). In general, Sakha is the coldest Siberian region, and the basin of the Yana River has the lowest temperatures of all, with permafrost reaching 1,493 metres (4,898 ft). Nevertheless, as far as Imperial Russian plans of settlement were concerned, cold was never viewed as an impediment. In the winter, southern Siberia sits near the center of the semi-permanent Siberian High, so winds are usually light in the winter. Precipitation in Siberia is generally low, exceeding 500 millimetres (20 in) only in Kamchatka where moist winds flow from the Sea of Okhotsk onto high mountains – producing the region's only major glaciers, though volcanic eruptions and low summer temperatures allow limited forests to grow. Precipitation is high also in most of Primorye in the extreme south where monsoonal influences can produce quite heavy summer rainfall. Researchers, including Sergei Kirpotin at Tomsk State University and Judith Marquand at Oxford University, warn that Western Siberia has begun to thaw as a result of global warming. The frozen peat bogs in this region may hold billions of tons of methane gas, which may be released into the atmosphere. Methane is a greenhouse gas 22 times more powerful than carbon dioxide. In 2008, a research expedition for the American Geophysical Union detected levels of methane up to 100 times above normal in the atmosphere above the Siberian Arctic, likely the result of methane clathrates being released through holes in a frozen 'lid' of seabed permafrost, around the outfall of the Lena River and the area between the Laptev Sea and East Siberian Sea. A Siberian tigress and cub. The term "Siberia" has a long history. Its meaning has gradually changed during ages. Historically, Siberia was defined as the whole part of Russia to the east of Ural Mountains, including the Russian Far East. According to this definition, Siberia extended eastward from the Ural Mountains to the Pacific coast, and southward from the Arctic Ocean to the border of Russian Central Asia and the national borders of both Mongolia and China. Soviet-era sources (Great Soviet Encyclopedia and others) and modern Russian ones usually define Siberia as a region extending eastward from the Ural Mountains to the watershed between Pacific and Arctic drainage basins, and southward from the Arctic Ocean to the hills of north-central Kazakhstan and the national borders of both Mongolia and China. By this definition, Siberia includes the federal subjects of the Siberian Federal District, and some of the Ural Federal District, as well as Sakha (Yakutia) Republic, which is a part of the Far Eastern Federal District. 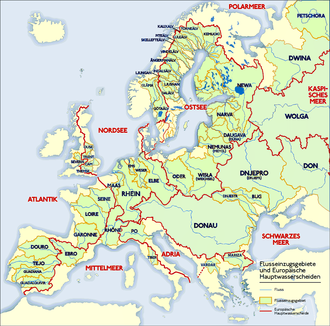 Geographically, this definition includes subdivisions of several other subjects of Urals and Far Eastern federal districts, but they are not included administratively. This definition excludes Sverdlovsk Oblast and Chelyabinsk Oblast, both of which are included in some wider definitions of Siberia. Other sources may use either a somewhat wider definition that states the Pacific coast, not the watershed, is the eastern boundary (thus including the whole Russian Far East) or a somewhat narrower one that limits Siberia to the Siberian Federal District (thus excluding all subjects of other districts). In Russian, the word for Siberia is used as a substitute for the name of the federal district by those who live in the district itself and less commonly used to denote the federal district by people residing outside of it. Yekaterinburg – Some sources such as Encyclopædia Britannica include this city as it lies in the Ural Mountains. Inhabitants have distanced themselves though saying that there is a difference between Siberian and Urals culture. Siberia is extraordinarily rich in minerals, containing ores of almost all economically valuable metals. It has some of the world's largest deposits of nickel, gold, lead, coal, molybdenum, gypsum, diamonds, diopside, silver and zinc, as well as extensive unexploited resources of oil and natural gas. Around 70% of Russia's developed oil fields are in the Khanty-Mansiysk region. Russia contains about 40% of the world's known resources of nickel at the Norilsk deposit in Siberia. Norilsk Nickel is the world's biggest nickel and palladium producer. Siberian agriculture is severely restricted by the short growing season of most of the region. However, in the southwest where soils are exceedingly fertile black earths and the climate is a little more moderate, there is extensive cropping of wheat, barley, rye and potatoes, along with the grazing of large numbers of sheep and cattle. Elsewhere food production, owing to the poor fertility of the podzolic soils and the extremely short growing seasons, is restricted to the herding of reindeer in the tundra—which has been practiced by natives for over 10,000 years. 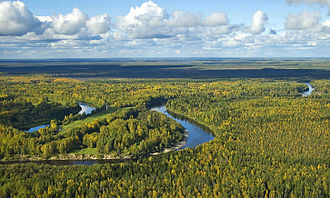 Siberia has the world's largest forests. Timber remains an important source of revenue, even though many forests in the east have been logged much more rapidly than they are able to recover. The Sea of Okhotsk is one of the two or three richest fisheries in the world owing to its cold currents and very large tidal ranges, and thus Siberia produces over 10% of the world's annual fish catch, although fishing has declined somewhat since the collapse of the USSR. While the development of renewable energy in Russia is held back by the lack of a conducive government policy framework, Siberia still offers special opportunities for off-grid renewable energy developments. Remote parts of Siberia are too costly to connect to central electricity and gas grids, and have therefore historically been supplied with costly diesel, sometimes flown in by helicopter. In such cases renewable energy is often cheaper. Professional football teams include FC Tom Tomsk, FC Sibir Novosibirsk and FK Yenisey Krasnoyarsk. The Yenisey Krasnoyarsk basketball team has played in the VTB United League since 2011–12. Russia's third most popular sport, bandy, is important in Siberia. In the 2015–16 Russian Bandy Super League season Yenisey from Krasnoyarsk became champions for the third year in a row by beating Baykal-Energiya from Irkutsk in the final. Two or three more teams (depending on the definition of Siberia) play in the Super League, the 2016–17 champions SKA-Neftyanik from Khabarovsk as well as Kuzbass from Kemerovo and Sibselmash from Novosibirsk. In 2007 Kemerovo got Russia's first indoor arena specifically built for bandy. Now Khabarovsk has the world's largest indoor arena specifically built for bandy, Arena Yerofey. It was venue for Division A of the 2018 World Championship. The 2019 Winter Universiade is currently being hosted by Krasnoyarsk. Tomsk, one of the oldest Siberian cities, was founded in 1604. According to the Russian Census of 2010, the Siberian and Far Eastern Federal Districts, located entirely east of the Ural Mountains, together have a population of about 25.6 million. 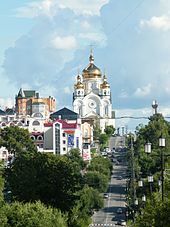 Tyumen and Kurgan Oblasts, which are geographically in Siberia but administratively part of the Urals Federal District, together have a population of about 4.3 million. Thus, the whole region of Asian Russia (or Siberia in the broadest usage of the term) is home to approximately 30 million people. 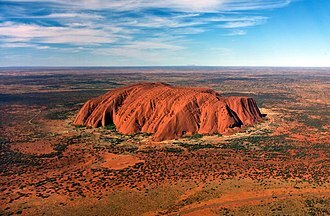 It has a population density of about three people per square kilometre. All Siberians are Russian citizens, and of these Russian citizens of Siberia, most are Slavic-origin Russians and russified Ukrainians. The remaining Russian citizens of Siberia consists of other groups of non-indigenous ethnic origins and those of indigenous Siberian origin. 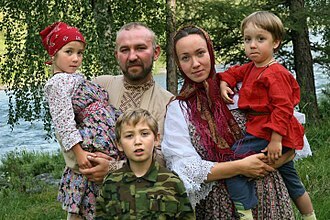 Among the largest non-Slavic group of Russian citizens of Siberia are the approximately 400,000 ethnic Volga Germans, Russified Romanians with ancestral origins from Bessarabia (present-day Moldova) also live in Siberia. The original indigenous groups of Siberia, including Mongol and Turkic groups such as Buryats, Tuvinians, Yakuts, and Siberian Tatars still mostly reside in Siberia, though they are minorities outnumbered by all other non-indigenous Siberians. Indeed, Slavic-origin Russians by themselves outnumber all of the indigenous peoples combined, both in Siberia as a whole and its cities, except in the Republic of Tuva. Slavic-origin Russians make up the majority in the Buryat, Sakha, and Altai Republics, outnumbering the indigenous Buryats, Sakha, and Altai. The Buryat make up only 25% of their own republic, and the Sakha and Altai each are only one-third, and the Chukchi, Evenk, Khanti, Mansi, and Nenets are outnumbered by non-indigenous peoples by 90% of the population. According to the 2002 census there are 500,000 Tatars in Siberia, but of these, 300,000 are Volga Tatars who also settled in Siberia during periods of colonization and are thus also non-indigenous Siberians, in contrast to the 200,000 Siberian Tatars which are indigenous to Siberia. Of the indigenous Siberians, the Buryats, numbering approximately 500,000, are the most numerous group in Siberia, and they are mainly concentrated in their homeland, the Buryat Republic. According to the 2002 census there were 443,852 indigenous Yakuts. Other ethnic groups indigenous to Siberia include Kets, Evenks, Chukchis, Koryaks, Yupiks, and Yukaghirs. About seventy percent of Siberia's people live in cities, mainly in apartments. Many people also live in rural areas, in simple, spacious, log houses. Novosibirsk is the largest city in Siberia, with a population of about 1.5 million. Tobolsk, Tomsk, Tyumen, Krasnoyarsk, Irkutsk, and Omsk are the older, historical centers. There are a variety of beliefs throughout Siberia, including Orthodox Christianity, other denominations of Christianity, Tibetan Buddhism and Islam. The Siberian Federal District alone has an estimation of 250,000 Muslims. An estimated 70,000 Jews live in Siberia, some in the Jewish Autonomous Region. The predominant religious group is the Russian Orthodox Church. Tradition regards Siberia the archetypal home of shamanism, and polytheism is popular. These native sacred practices are considered by the tribes to be very ancient. There are records of Siberian tribal healing practices dating back to the 13th century. The vast territory of Siberia has many different local traditions of gods. These include: Ak Ana, Anapel, Bugady Musun, Kara Khan, Khaltesh-Anki, Kini'je, Ku'urkil, Nga, Nu'tenut, Numi-Torem, Numi-Turum, Pon, Pugu, Todote, Toko'yoto, Tomam, Xaya Iccita, Zonget. 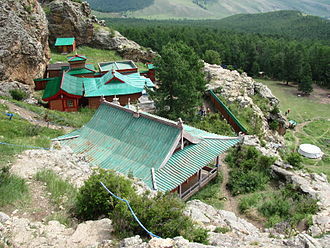 Places with sacred areas include Olkhon, an island in Lake Baikal. Many cities in northern Siberia, such as Petropavlovsk-Kamchatsky, cannot be reached by road, as there are virtually none connecting from other major cities in Russia or Asia. The best way to tour Siberia is through the Trans-Siberian Railway. The Trans-Siberian Railway operates from Moscow in the west to Vladivostok in the east. Cities that are located far from the railway are best reached by air or by the separate Baikal-Amur-Railway (BAM). Stroganina is a raw fish dish of the indigenous people of northern Arctic Siberia made from raw, thin, long-sliced frozen fish. It is a popular dish with native Siberians. ^ "Great Soviet Encyclopedia (in Russian)". Encycl.yandex.ru. Archived from the original on 12 July 2012. Retrieved 15 May 2010. ^ "Arctic Oscillation and Polar Vortex Analysis and Forecasts". AER. Retrieved 20 May 2018. ^ Euan Ferguson (19 May 2007). "Trans-Siberian for softies". the Guardian. Retrieved 14 January 2016. ^ Crossley, Pamela Kyle (2002). The Manchus. Peoples of Asia. 14 (3rd ed.). Wiley-Blackwell. p. 213. ISBN 978-0-631-23591-0. Retrieved 28 December 2013. ^ Czaplicka, M.C. (1915). 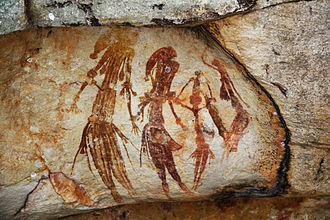 Aboriginal Siberia. ^ Baikaloff, Anatole (December 1950). "Notes on the origin of the name "Siberia"". Slavonic and East European Review. 29 (72): 288. 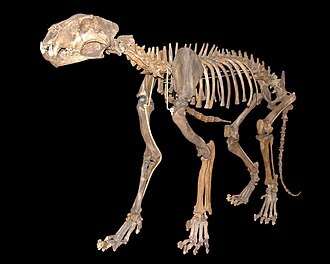 ^ "Meet this extinct cave lion, at least 10,000 years old – world exclusive". siberiantimes.com. Retrieved 30 January 2016. ^ "Yellowstone's Super Sister". Archived from the original on 14 March 2005. Retrieved 17 April 2010. [...] the Siberian Traps is the prime suspect in wiping out 90 percent of all living species 251 million years ago – the most severe extinction event in Earth's history. . Discovery Channel. 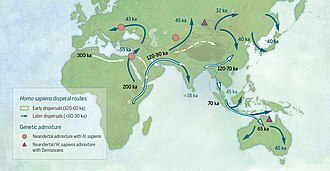 ^ " DNA identifies new ancient human dubbed 'X-woman'," BBC News. 25 March 2010. ^ Pakendorf, B.; Novgorodov, I. N.; Osakovskij, V. L.; Danilova, A. B. P.; Protod'Jakonov, A. P.; Stoneking, M. (2006). "Investigating the effects of prehistoric migrations in Siberia: Genetic variation and the origins of Yakuts". Human Genetics. 120 (3): 334–353. doi:10.1007/s00439-006-0213-2. PMID 16845541. This article incorporates text from this source, which is in the public domain. ^ Richards, 2003 p. 538. ^ Sean C. Goodlett. "Russia's Expansionist Policies I. The Conquest of Siberia". Falcon.fsc.edu. Archived from the original on 11 May 2011. Retrieved 15 May 2010. ^ Fisher, Raymond H.; Treadgold, Donald W. (1958). "Review: The Great Siberian Migration: Government and Peasant in Resettlement from Emancipation to the First World War". The American Historical Review. 63 (4): 989–990. doi:10.2307/1848991. JSTOR 1848991. ^ Farinella, Paolo; Foschini, L.; Froeschlé, Christiane; Gonczi, R.; Jopek, T. J.; Longo, G.; Michel, Patrick (2001). "Probable asteroidal origin of the Tunguska Cosmic Body" (PDF). Astronomy & Astrophysics. 377(3): 1081–1097. Bibcode:2001A&A...377.1081F. doi:10.1051/0004-6361:20011054. ^ Robert Conquest in "Victims of Stalinism: A Comment," Europe-Asia Studies, Vol. 49, No. 7 (Nov. 1997), pp. 1317–1319 states: "We are all inclined to accept the Zemskov totals (even if not as complete) with their 14 million intake to Gulag 'camps' alone, to which must be added four to five million going to Gulag 'colonies', to say nothing of the 3.5 million already in, or sent to, 'labour settlements'. However taken, these are surely 'high' figures." ^ Zemskov, "Gulag," Sociologičeskije issledovanija, 1991, No. 6, pp. 14–15. ^ Courtois and Kramer (1999), Livre noir du Communisme, p.239. ^ "Gulag: a History of the Soviet Camps". Arlindo-correia.org. Retrieved 6 January 2009. ^ "Altai: Saving the Pearl of Siberia". Archived from the original on 22 March 2007. Retrieved 30 November 2006. ^ "Novosibirsk climate". Worldclimate.com. 4 February 2007. Retrieved 15 May 2010. ^ "Omsk climate". Worldclimate.com. 4 February 2007. Retrieved 15 May 2010. ^ "Kazachengoye climate". Worldclimate.com. 4 February 2007. Retrieved 15 May 2010. ^ "Delyankir, Russia – Monthly weather forecast and Climate data". Weather Atlas. Retrieved 20 November 2018. ^ Гидрометцентр России (in Russian). Archived from the original on 27 June 2008. Retrieved 8 January 2009. 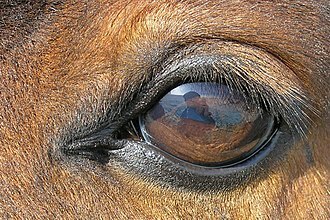 ^ Connor, Steve (23 September 2008). "Exclusive: The methane time bomb". The Independent. Retrieved 3 October 2008. ^ Valerius Geist (January 1998). Deer of the World: Their Evolution, Behaviour, and Ecology. Stackpole Books. p. 211. ISBN 978-0-8117-0496-0. Retrieved 30 January 2016. ^ Nyambayar, B.; Mix, H. & Tsytsulina, K. (2008). "Moschus moschiferus". IUCN Red List of Threatened Species. Version 2008. International Union for Conservation of Nature. Retrieved 30 January 2016. Database entry includes a brief justification of why this species is of vulnerable. ^ Uphyrkina, O.; Miquelle, D.; Quigley, H.; Driscoll, C.; O’Brien, S. J. (2002). "Conservation Genetics of the Far Eastern Leopard (Panthera pardus orientalis)" (PDF). Journal of Heredity. 93 (5): 303–11. doi:10.1093/jhered/93.5.303. PMID 12547918. Archived from the original (PDF) on 4 February 2016. Retrieved 30 January 2016. ^ Miquelle, D.; Darman, Y.; Seryodkin, I. (2011). "Panthera tigris ssp. altaica". IUCN Red List of Threatened Species. Version 2014.2. International Union for Conservation of Nature. Retrieved 30 January 2016. ^ Garshelis, D. L.; Steinmetz, R. & IUCN SSC Bear Specialist Group (2008). "Ursus thibetanus". IUCN Red List of Threatened Species. Version 2015.2. International Union for Conservation of Nature. Retrieved 30 January 2016. ^ McLellan, B.N. ; Servheen, C. & Huber, D. (2008). "Ursus arctos". IUCN Red List of Threatened Species. Version 2008. International Union for Conservation of Nature. Retrieved 30 January 2016. ^ Farjon, A. (2013). "Pinus pumila". The IUCN Red List of Threatened Species. 2013: e.T42405A2977712. doi:10.2305/IUCN.UK.2013-1.RLTS.T42405A2977712.en. Retrieved 12 January 2018. ^ A. Farjon (2013). "Picea obovata". The IUCN Red List of Threatened Species. 2013: e.T42331A2973177. doi:10.2305/IUCN.UK.2013-1.RLTS.T42331A2973177.en. Retrieved 12 January 2018. ^ Encyclopædia Britannica. "Siberia-Britannica online encyclopedia". Britannica.com. Retrieved 15 May 2010. ^ David Filipov (5 January 2017). "This Russian city says: 'Don't call us Siberia'". The Washington Post. Retrieved 6 January 2017. ^ Schlindwein, Simone (26 August 2008). "The City Built on Oil: EU-Russia Summit Visits Siberia's Boomtown". Spiegel Online. Spiegel. Retrieved 8 August 2014. ^ "Norilsk raises 2010 nickel output forecast". Reuters. 29 January 2010. Retrieved 8 August 2014. ^ "FAO National Aquaculture Sector Overview (NASO)". 16 January 2005. Retrieved 14 January 2016. ^ Overland, Indra; Kjaernet, Heidi (2009). Russian renewable energy: The potential for international cooperation. Ashgate. ^ Overland, Indra (2011). "The Siberian Curse: A Blessing in Disguise for Renewable Energy?". Sibirica. 9 (2): 1–20. doi:10.3167/sib.2010.090201 – via ResearchGate. ^ "Google Translate". Retrieved 14 April 2016. ^ "Информация о стадионе "КЛМ стадиона "Химик", Кемерово – Реестр – Федерация хоккея с мячом России". rusbandy.ru. Retrieved 14 April 2016. ^ "Информация о стадионе "Арена "Ерофей", Хабаровск – Реестр – Федерация хоккея с мячом России". rusbandy.ru. Retrieved 14 April 2016. ^ "Census 2010 official results (Russian) Archived 23 May 2013 at WebCite"
^ "Ukrainians in Russia's Far East try to maintain community life". The Ukrainian Weekly. May 4, 2003. ^ "Siberian Germans". Everyculture.com. Retrieved 15 May 2010. ^ Batalden 1997, p. 37. 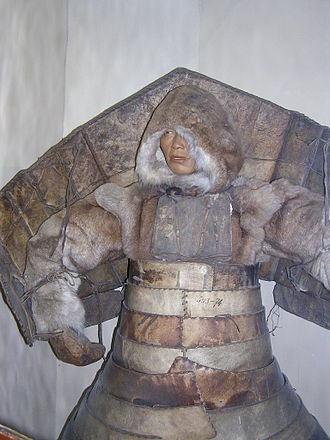 ^ World Directory of Minorities and Indigenous Peoples – Russian Federation: Buryats. ^ World Directory of Minorities and Indigenous Peoples – Russian Federation: Yakuts. ^ Arnold, Thomas Walker (1896). The Preaching of Islam: A History of the Propagation of the Muslim Faith. Westminster: Archibald Constable and Company. pp. 206–207. Retrieved 11 October 2015. Of the spread of Islam among the Tatars of Siberia, we have a few particulars. It was not until the latter half of the sixteenth century that it gained a footing in this country, but even before this period Muhammadan missionaries had from time to time made their way into Siberia with the hope of winning the heathen population over to the acceptance of their faith, but the majority of them met with a martyr's death. When Siberia came under Muhammadan rule, in the reign of Kuchum Khan, the graves of seven of these missionaries were discovered [...]. [...] Kuchum Khan [...] made every effort for the conversion of his subjects, and sent to Bukhara asking for missionaries to assist him in this pious undertaking. ^ "Planting Jewish roots in Siberia". Fjc.ru. 24 May 2004. Archived from the original on 27 August 2009. Retrieved 15 May 2010. ^ "Secrets of Siberian Shamanism | New Dawn : The World's Most Unusual Magazine". www.newdawnmagazine.com. 16 May 2013. Retrieved 9 January 2017. ^ Rasputin, V.; Winchell, M.; Mikkelson, G. (1997). Siberia, Siberia. Northwestern University Press. pp. 322–323. ISBN 978-0-8101-1575-0. ^ Motarjemi, Yasmine; Moy, Gerald; Todd, E. C. D. (2013). Encyclopedia of Food Safety. Amsterdam: Elsevier Science, Academic Press. p. 176. ISBN 978-0-12-378613-5. Bisher, Jamie (2006). White Terror: Cossack Warlords of the Trans-Siberian. Routledge. ISBN 978-1135765958. Retrieved 24 April 2014. Bisher, Jamie (2006). White Terror: Cossack Warlords of the Trans-Siberian. Routledge. ISBN 978-1135765965. Retrieved 24 April 2014. Black, Jeremy (2008). War and the World: Military Power and the Fate of Continents, 1450–2000. Yale University Press. ISBN 978-0300147698. Retrieved 24 April 2014. Nicholas B. Breyfogle, Abby Schrader and Willard Sunderland (eds), Peopling the Russian Periphery: Borderland Colonization in Eurasian history (London, Routledge, 2007). Forsyth, James (1994). A History of the Peoples of Siberia: Russia's North Asian Colony 1581–1990 (illustrated, reprint, revised ed.). Cambridge University Press. ISBN 978-0521477710. Retrieved 24 April 2014. James Forsyth, A History of the Peoples of Siberia: Russia's North Asian Colony, 1581–1990 (Cambridge, Cambridge University Press, 1994). 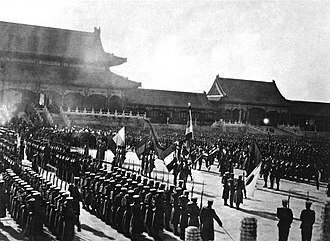 Steven G. Marks, Road to Power: The Trans-Siberian Railroad and the Colonization of Asian Russia, 1850–1917 (London, I.B. Tauris, 1991). Igor V. Naumov, The History of Siberia. Edited by David Collins (London, Routledge, 2009) (Routledge Studies in the History of Russia and Eastern Europe). Wood, Alan (2011). Russia's Frozen Frontier: A History of Siberia and the Russian Far East 1581 – 1991 (illustrated ed.). A&C Black. ISBN 978-0340971246. Retrieved 24 April 2014. Alan Wood (ed. ), The History of Siberia: From Russian Conquest to Revolution (London, Routledge, 1991). The woolly mammoth is a species of mammoth that lived during the Pleistocene epoch, and was one of the last in a line of mammoth species, beginning with Mammuthus subplanifrons in the early Pliocene. The woolly mammoth diverged from the steppe mammoth about 400,000 years ago in East Asia and its closest extant relative is the Asian elephant. Mammoth remains had long known in Asia before they became known to Europeans in the 17th century. The origin of these remains was long a matter of debate, the mammoth was identified as an extinct species of elephant by Georges Cuvier in 1796. The woolly mammoth was roughly the size as modern African elephants. Males reached shoulder heights between 2.7 and 3.4 m and weighed up to 6 tonnes, females reached 2. 6–2.9 m in shoulder heights and weighed up to 4 tonnes. A newborn calf weighed about 90 kilograms, the woolly mammoth was well adapted to the cold environment during the last ice age. It was covered in fur, with a covering of long guard hairs. The colour of the coat varied from dark to light, the ears and tail were short to minimise frostbite and heat loss. It had long, curved tusks and four molars, which were replaced six times during the lifetime of an individual and its behaviour was similar to that of modern elephants, and it used its tusks and trunk for manipulating objects and foraging. The diet of the mammoth was mainly grass and sedges. Individuals could probably reach the age of 60 and its habitat was the mammoth steppe, which stretched across northern Eurasia and North America. The woolly mammoth coexisted with humans, who used its bones and tusks for making art and dwellings. Isolated populations survived on St. Paul Island until 5,600 years ago, after its extinction, humans continued using its ivory as a raw material, a tradition that continues today. It has been proposed the species could be recreated through cloning, the first woolly mammoth remains studied by European scientists were examined by Hans Sloane in 1728 and consisted of fossilised teeth and tusks from Siberia. Sloane was the first to recognise that the remains belonged to elephants, others interpreted Sloanes conclusion slightly differently, arguing the flood had carried elephants from the Tropics to the Arctic. In geology, permafrost is ground, including rock or soil, at or below the freezing point of water 0 °C for two or more years. Most permafrost is located in high latitudes, but alpine permafrost may exist at altitudes in much lower latitudes. Ground ice is not always present, as may be in the case of nonporous bedrock, Permafrost accounts for 0. 022% of total water on earth and exists in 24% of exposed land in the Northern Hemisphere. It occurs subsea on the shelves of the continents surrounding the Arctic Ocean, portions of which were exposed during the last glacial period. A global temperature rise of 1.5 °C above current levels would be enough to start the thawing of permafrost in Siberia, Permafrost is soil, rock or sediment that is frozen for more than two consecutive years. In areas not overlain by ice, it exists beneath a layer of soil, rock or sediment, in practice, this means that permafrost occurs at an average air temperature of -2 °C or colder. Active layer thickness varies with the season, but is 0.3 to 4 meters thick, in the Northern Hemisphere, 24% of the ice-free land area, equivalent to 19 million square kilometers, is more or less influenced by permafrost. Most of this area is found in Siberia, northern Canada, beneath the active layer annual temperature swings of permafrost become smaller with depth. The deepest depth of permafrost occurs where geothermal heat maintains a temperature above freezing, above that bottom limit there may be permafrost, whose temperature doesnt change annually—isothermal permafrost. The extent of permafrost varies with the climate, today, a considerable area of the Arctic is covered by permafrost. Overlying permafrost is an active layer that seasonally thaws during the summer. Plant life can be supported only within the active layer since growth can occur only in soil that is fully thawed for some part of the year, thickness of the active layer varies by year and location, but is typically 0. 6–4 m thick. In areas of continuous permafrost and harsh winters, the depth of the permafrost can exceed 1,400 m, Permafrost can store carbon, both as peat and as methane. Work investigating the permafrost carbon pool size estimates that 1400–1700 Gt of carbon is stored in the northern circumpolar permafrost region, while a recent study that includes stores of the Tibetan Plateau, estimates total carbon pools in the permafrost of the Northern Hemisphere to be 1832 Gt. Bison are large, even-toed ungulates in the genus Bison within the subfamily Bovinae. Two extant and four species are recognized. Of the four species, three were North American endemics, Bison antiquus, B. latifrons, and B. occidentalis. The fourth, B. priscus, ranged across steppe environments from Western Europe, through Central Asia, East Asia including Japan, of the two surviving species, the American bison, B. bison, found only in North America, is the more numerous. 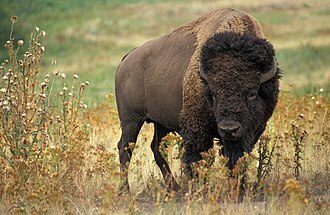 Although sometimes referred to historically as a buffalo, it is distantly related to the true buffalo. The North American species is composed of two subspecies, the Plains bison, B. b. bison, and the Wood bison, B. b. athabascae, which is the namesake of Wood Buffalo National Park in Canada. A third subspecies, the Eastern Woodland Bison is no longer considered a valid taxon, references to Woods Bison or Wood Bison from the eastern United States confusingly refer to this subspecies, not B. b. athabascae, which was not found in the region. The European bison B. bonasus, or wisent, is found in Europe, while all bison species are classified in their own genus, they are sometimes bred with domestic cattle and produce fertile offspring called beefalo or zubron. The American bison and the European bison are the largest surviving terrestrial animals in North America, Bison are good swimmers and can cross rivers over half a mile wide. They are nomadic grazers and travel in herds, the bulls leave the herds of females at two or three years of age, and join a male herd, which are generally smaller than female herds. Towards the end of the summer, for the reproductive season, American bison are known for living in the Great Plains, but formerly had a much larger range including much of the eastern United States and parts of Mexico. The American Plains bison is no longer listed as endangered, genetically pure B. b. bison currently number only ~20,000, separated into fragmented herds - all of which require active conservation measures. 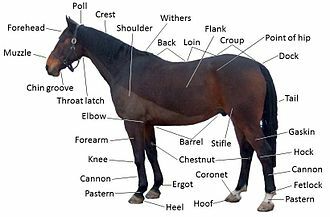 Although superficially similar and behavioural differences exist between the American and European bison, the American species has 15 ribs, while the European bison has 14. Although outnumbered, the Russians pressured the various family-based tribes into changing their loyalties and establishing distant forts from which they conducted raids. To counter this, Kuchum Khan attempted to centralize his rule by imposing Islam on his subjects, the Russian conquest of Siberia began in July 1580 when some 540 Cossacks under Yermak Timofeyevich invaded the territory of the Voguls, subjects to Küçüm, the Khan of Siberia. They were accompanied by 300 Lithuanian and German slave laborers, whom the Stroganovs had purchased from the tsar, throughout 1581, this force traversed the territory known as Yugra and subdued Vogul and Ostyak towns. At this time, they captured a tax collector of Küçüm. Following a series of Tatar raids in retaliation against the Russian advance, Yermaks forces prepared for a campaign to take Qashliq, the force embarked in May 1582. After a three-day battle on the banks of the river Irtysh, Yermak was victorious against a force of Küçüm Khan. On 29 June, the Cossack forces were attacked by the Tatars, throughout September 1582, the Khan gathered his forces for a defence of Qashliq. A horde of Siberian Tatars and Ostyaks massed at Mount Chyuvash to defend against invading Cossacks, on 1 October, a Cossack attempt to storm the Tatar fort at Mount Chyuvash was held off. On 23 October, the Cossacks attempted to storm the Tatar fort at Mount Chyuvash for a time when the Tatars counterattacked. More than a hundred Cossacks were killed, but their gunfire forced a Tatar retreat, the forces of the Khan retreated, and Yermak entered Qashliq on 26 October. Küçüm Khan retreated into the steppes and over the few years regrouped his forces. He suddenly attacked Yermak on 6 August 1584 in the dead of night, the remains of Yermaks forces under the command of Mescheryak retreated from Qashliq, destroying the city as they left. In 1586 the Russians returned, and after subduing the Khanty, the Tatar tribes that were submissive to Küçüm Khan suffered from several attacks by the Russians between 1584–1595, however, Küçüm Khan would not be caught. Finally, in August 1598 Küçüm Khan was defeated at the Battle of Urmin near the river Ob, in the course of the fight the Siberian royal family were captured by the Russians. The steppes of Siberia were occupied by a succession of nomadic peoples, including the Khitan people, various Turkic peoples, and the Mongol Empire. In the late Middle Ages, Tibetan Buddhism spread into the south of Lake Baikal. In the 16th and 17th centuries, Russians from the west entered the region, developing some settlements and this arrival of newcomers was contemporaneous and in many regards analogous to the European colonization of the Americas. During the Russian Empire, Siberia was chiefly developed as an agricultural province, the government used it as a place of exile, sending Avvakum and the Decemberists, among others, to work camps in the region. During the 19th century, the Trans-Siberian Railway was constructed, supporting industrialization and this was aided by the discovery and exploitation of vast reserves of Siberian mineral resources. 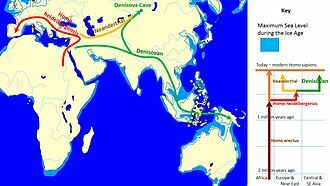 According to the field of genealogy, people first resided in Siberia by 45,000 BCE and spread out east and west to populate Europe. 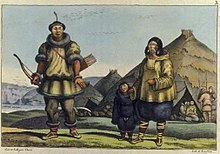 According to Vasily Radlov, among the earliest inhabitants of Central Siberia were the Yeniseians, the Kets are considered the last remainder of this early migration. Migrants are estimated to have crossed the Bering Land Bridge into North America more than 20,000 years ago, the shores of all Siberian lakes, which filled the depressions during the Lacustrine period, abound in remains dating from the Neolithic age. 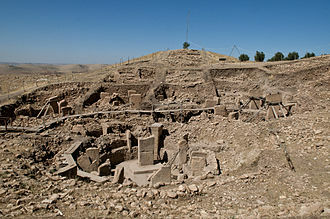 Countless kurgans and other archaeological artifacts bear witness to a dense population, some of the earliest artifacts found in Central Asia derive from Siberia. The Yeniseians were followed by the Uralic Samoyede, who came from the northern Ural region, some descendant cultures, such as the Selkup, remain in the Sayan region. They are credited with leaving behind the numerous remains dating from the Bronze Age. Iron was unknown to them, but they excelled in bronze and their bronze ornaments and implements, often polished, evince considerable artistic taste. They developed and managed irrigation to support their agriculture in areas of the fertile tracts. Indo-Iranian influences in southwestern Siberia can be dated to the 2300–1000 BCE Andronovo culture, between the 7th and 3rd centuries BCE, the Indo-Iranian Scythians flourished in the Altai region. The woolly rhinoceros is an extinct species of rhinoceros that was common throughout Europe and northern Asia during the Pleistocene epoch and survived the last glacial period. 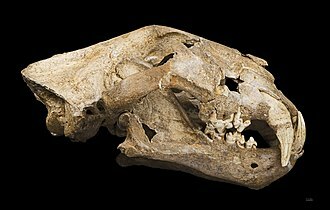 The genus name Coelodonta means cavity tooth, the woolly rhinoceros was a member of the Pleistocene megafauna. As the last and most derived member of the Pleistocene rhinoceros lineage, stocky limbs and thick woolly pelage made it well suited to the steppe-tundra environment prevalent across the Palearctic ecozone during the Pleistocene glaciations. Like the vast majority of rhinoceroses, the plan of the woolly rhinoceros adhered to a conservative morphology. A study of 40, 000- to 70, 000-year-old DNA samples showed its closest extant relative is the Sumatran rhinoceros, the appearance of woolly rhinos is known from mummified individuals from Siberia as well as cave paintings. An adult woolly rhinoceros was typically around 3 to 3.8 metres in length, with a weight of around 1. The woolly rhinoceros could grow to be 2 m tall, the size was thus comparable to, or slightly larger than. Two horns on the skull were made of keratin, the horn being 61 cm in length, with a smaller horn between its eyes. 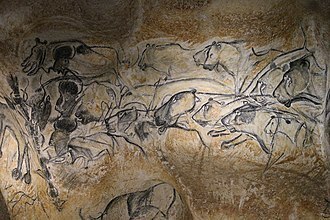 It had thick, long fur, small ears, thick legs, Cave paintings suggest a wide dark band between the front and hind legs, but the feature is not universal, and the identification of pictured rhinoceroses as woolly rhinoceros is uncertain. Its shape was only from prehistoric cave drawings until a completely preserved specimen was discovered in a tar pit in Starunia. The specimen, a female, is now on display in the Polish Academy of Sciences Museum of Natural History in Kraków. 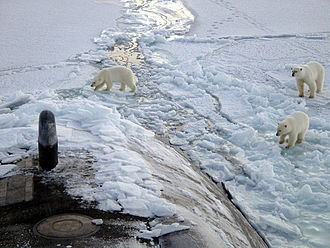 Several frozen specimens have found in Siberia, the latest in 2007. The woolly rhinoceros used its horns for defensive purposes and to attract mates, during Greenland Stadial 2 the North Sea retreated northward, as sea levels were up to 125 metres lower than today. The woolly rhinoceros roamed the exposed Doggerland and much of Northern Europe and was common in the cold, arid desert that is southern England and its geographical range expanded and contracted with the alternating cold and warm cycles, forcing populations to migrate as glaciers receded. Muscovite voevodas in the new-built fortress of Tyumen, from the Remezov Chronicle. Excavating ice-rich permafrost with a jackhammer in Alaska. Recently thawed Arctic permafrost and coastal erosion on the Beaufort Sea, Arctic Ocean, near Point Lonely, Alaska in 2013. 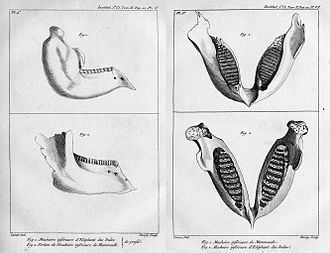 1930s illustration of the lectotype molars by Henry Fairfield Osborn: The left one is now lost.